A skunk sprayed the outside of your home, and the smell seeped inside? Your dog was sprayed by a skunk and in order to clean it, you brought the bad smell inside? Keep in mind that it is possible to neutralize the smell. Relying on over 30 years of expertise, SOS Odours offers a unique solution and approach against skunk odours. 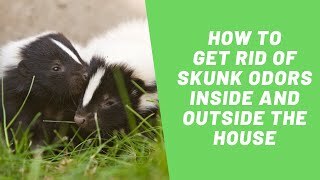 How to Neutralize Skunk Odours Inside the House? Follow the steps described below or watch the video. If the smell is all over the house, clean the walls, floors and ceilings with the D-500 product. If the smell of skunk is also present on textiles (carpets, curtains, sofas, bedding, etc. ), spray URI-CLEAN and let it work. To eliminate the smell of skunk in the ambient air, just spray D-500 on a clean cloth and hang it on a fan. Turn the unit on for one hour and set the fan into each room where the odour is present. To get rid of the skunk odour found in the ventilation system, it is possible to clean the filters (air conditioning, air exchanger) with D-500. Turn on the system to allow the D-500 to spread throughout the house.